Federal agents have arrested illegal immigrants at California courthouses because local authorities have made such apprehensions at jails difficult, the Trump administration's top two law enforcement officials told the state's chief justice, who had requested a halt to the practice. In a letter to Chief Justice Tani Cantil-Sakauye made public on Friday, U.S. Attorney General Jeff Sessions and Department of Homeland Security Secretary John Kelly gave no indication that agents would stop the arrests. Sessions and Kelly criticized California officials for limiting the cooperation of state and local law enforcement officers with U.S. agents, preventing them from going to jails to pick up illegal immigrants arrested for other crimes. 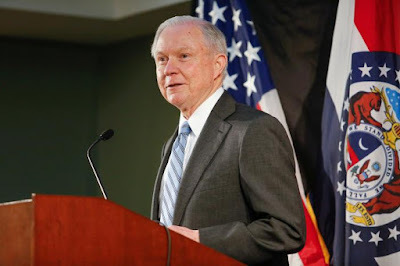 "As a result, ICE officers and agents are required to locate and arrest these aliens in public places, rather than in secure jail facilities," Sessions and Kelly wrote in the letter dated on Wednesday, using the acronym for Immigration and Customs Enforcement. Kelly, whose Department of Homeland Security includes ICE, and Sessions, who as attorney general heads the Justice Department, are members of Republican President Donald Trump's Cabinet. Since taking office in January, Trump has widened the net for illegal immigrants to be detained and removed from the country, in keeping with his White House campaign promise. Immigrant rights groups say federal agents have entered courthouses with increased frequency this year, including in California, Massachusetts, Maryland and Texas. California law enforcement officers, including in Los Angeles and San Francisco, decline requests from ICE agents to hold illegal immigrants past their release dates in local jails so they can be transferred to federal custody. The stance of these law enforcement officials conforms with advice from the state's two most recent attorneys general. These and other "sanctuary" jurisdictions that opt not to cooperate with federal immigration agents have drawn fire from conservative Republicans. On Monday, Sessions threatened to withhold millions of dollars in U.S. funding for cities that fail to assist immigration authorities. In their letter, Kelly and Sessions said agents make arrests at courthouses rather than other public places in part because visitors are screened for weapons before entering, as they are at jails. They were responding to a letter sent two weeks ago by Cantil-Sakauye, who asked the two Cabinet officials to stop immigration agents from arresting undocumented immigrants inside California courthouses. "Courthouses should not be used as bait in the necessary enforcement of our country's immigration law," she wrote. The presence of immigration agents in courthouses in the nation's most populous state could undermine public trust in its judicial system, she said. Her letter went on to say that immigration agents were "stalking undocumented immigrants" at courthouses, language that drew a sharp rebuke from Sessions and Kelly. They said the use of the word "stalking" suggested criminal conduct. They said that was unwarranted because agents have full authority to arrest illegal immigrants.